ON THIS PAGE: You will find some basic information about this disease and the parts of the body it may affect. This is the first page of Cancer.Net’s Guide to Adult Acute Lymphocytic Leukemia. Use the menu to see other pages. Think of that menu as a roadmap for this complete guide. Leukemia is a cancer of the blood. Leukemia begins when healthy blood cells change and grow out of control. Acute lymphocytic leukemia (ALL) is a cancer of the immature lymphocytes. Lymphocytes are a type of white blood cell involved in the body’s immune system. ALL is also called acute lymphoid leukemia or acute lymphoblastic leukemia. Acute means that the disease begins and gets worse quickly. People with ALL usually need immediate treatment. ALL is most common in young children and adults older than 50, but people of any age can develop ALL. There are 3 different types of lymphocytes: B cells, T cells, and natural killer (NK) cells. T cells fight infections by activating other cells in the immune system and by destroying infected cells. NK cells fight microbes and cancer cells. About 85% of people with ALL have the B-cell subtype and about 15% have the T-cell type. The NK-cell subtype is quite rare. Lymphoblasts may also collect in a person’s lymphatic system and cause swelling of the lymph nodes. Some cells may invade other organs, including the brain, liver, spleen, thymus, or the testicles in men. Unlike other types of cancer, the spread of ALL to other parts of the body does not mean the cancer is in an advanced stage. Acute leukemia is usually found throughout the body when it is diagnosed and it may still be cured. This section is about ALL in adults. Read about childhood ALL. Cancer.Net En Español: Read about ALL in Spanish. Infórmase sobre leucemia linfocítica aguda en español. People with ALL may experience the following symptoms or signs. Sometimes, people with ALL do not have any of these changes. Or, the cause of a symptom may be a different medical condition that is not cancer. If leukemia is diagnosed, relieving symptoms remains an important part of care and treatment. This may also be called symptom management, palliative care, or supportive care. Be sure to talk with your health care team about the symptoms you experience, including any new symptoms or a change in symptoms. Blood tests. If your doctor suspects that you have ALL based on the symptoms, he or she may do a test called a complete blood count (CBC). This test examines the levels of different types of cells in the blood. Low levels of red blood cells and platelets are common in people with ALL, as are high, normal, or low levels of white blood cells. Changes in blood cell levels can also be a sign of another medical problem that is not leukemia. The blood may also be examined to find out if there are lymphoblasts or other abnormal cells. Bone marrow aspiration and biopsy. If the blood test shows abnormalities in the number or appearance of the white blood cells, you may need a bone marrow aspiration and biopsy. These 2 procedures are similar and often done at the same time to examine the bone marrow. Bone marrow has both a solid and a liquid part. A bone marrow aspiration removes a sample of the fluid with a needle. 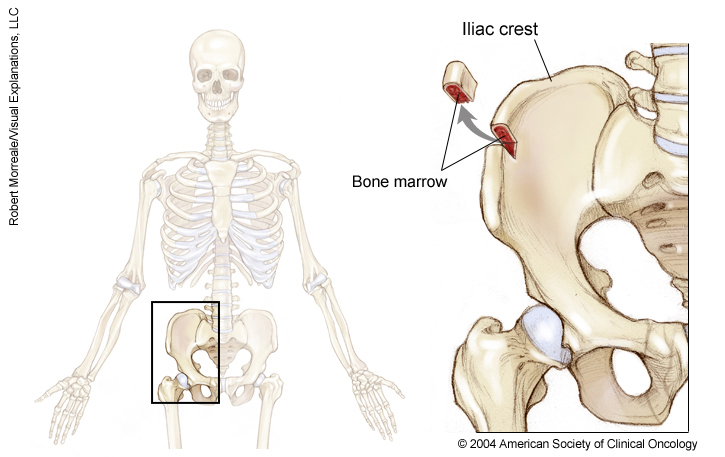 A bone marrow biopsy is the removal of a small amount of solid tissue using a needle. If blood tests (see above) indicate ALL, it is better to have the bone marrow aspiration and biopsy at the hospital where treatment will be given so the test does not need to be done again. A pathologist analyzes the sample(s) removed during a bone marrow aspiration and biopsy. A pathologist is a doctor who specializes in interpreting laboratory tests and evaluating cells, tissues, and organs to diagnose disease. The sample is used to look for leukemia, and molecular testing and immunophenotyping (see below) may also be done. A common site for a bone marrow aspiration and biopsy is the pelvic bone, which is located in the lower back by the hip. The skin in that area is usually numbed with medication beforehand. Other types of anesthesia (medication to block the awareness of pain) may also be used. Other testing. Your doctor may recommend running laboratory tests on the leukemia cells to identify specific genes, proteins, and other factors unique to the leukemia. Results of these tests will help decide whether your treatment options include a type of treatment called targeted therapy (see Treatment Options). Flow cytometry, also called immunophenotyping, and cytochemistry. These tests use chemicals or dyes on the cancer cells to learn more about the leukemia and its subtype. ALL cells have distinctive markers on their surface called cell surface proteins. The pattern of these markers is called the immunophenotype. These tests are used to distinguish ALL from healthy blood cells and from other types of leukemia, which can also involve lymphocytes. Both tests can be done from a blood sample. Karyotyping, or cytogenetics. This test examines a cell’s chromosomes. Chromosomes are long pieces of DNA that contain genes. People with ALL may have specific chromosomal changes, such as the addition or loss of certain chromosomes and translocations. A translocation is when parts of a chromosome have been moved to another chromosome. These changes can be found with special testing, such as a test called fluorescence in-situ hybridization (FISH). Approximately 25% of patients have a normal karyotype when diagnosed with ALL. About 20% to 30% of adults with ALL have a specific change in their chromosomes called the Philadelphia chromosome. The Philadelphia chromosome is an example of a small chromosome caused by a translocation. In this instance, it means that genetic material from chromosome 9 breaks off and attaches to chromosome 22 [t(9;22)]. Then, 2 specific genes called BCR and ABL join to make 1 gene called BCR-ABL. Some people may have other types of translocations. For example, many children with ALL have a translocation between chromosomes 12 and 21 [t(12;22)]. These genes are called TEL and AML1. Molecular assays. These tests may be able to find mutations in genes that cannot be seen with a microscope or found with cytogenetic tests. For example, patients with changes in the IKZF1 gene have a poorer long-term prognosis, which is the chance of recovery. Therefore, testing for these changes during diagnosis helps determine a patient’s treatment options. Lumbar puncture (spinal tap). A lumbar puncture is a procedure in which a doctor uses a needle to take a sample of cerebral spinal fluid (CSF) to look at the make up of the fluid and to find out is it contains cancer cells or blood. ALL tends to spread to the CSF, which is the fluid that flows around the brain and spinal cord. This means that lumbar punctures are done regularly during ALL treatment. Also, chemotherapy (see Treatment Options) may be given in the CSF. Doctors generally give an anesthetic to numb the lower back before the procedure. Imaging tests. The following imaging tests may be used to learn more about the cause of symptoms. They may also help diagnose infections in patients with ALL. Computed tomography (CT or CAT) scan. A CT scan creates a 3-dimensional picture of the inside of the body using x-rays taken from different angles. A computer combines these images into a detailed, cross-sectional view that shows any abnormalities or tumors. Sometimes, a contrast medium (a special dye) is injected into a patient’s vein or given orally (by mouth) to provide better detail. Magnetic resonance imaging (MRI). MRI uses magnetic fields, not x-rays, to produce detailed images of the body. A contrast medium may be injected into a patient’s vein or given orally (by mouth) to create a clearer picture. Positron emission tomography (PET) or PET-CT scan. A PET scan is usually combined with a CT scan (see above), called a PET-CT scan. However, you may hear your doctor refer to this procedure just as a PET scan. A PET scan is a way to create pictures of organs and tissues inside the body. A small amount of a radioactive substance is injected into a patient’s body. This substance is absorbed mainly by organs and tissues that use the most energy. Because cancer tends to use energy actively, it absorbs more of the radioactive substance. A scanner then detects this substance to produce images of the inside of the body. After diagnostic tests are done, your doctor will review all of the results with you. If the diagnosis is ALL, results can also help the doctor describe the disease. This is called classification. The next section in this guide is Subtypes and Classification. It explains the system doctors use to describe the extent of the disease. You may use the menu to choose a different section to read in this guide. ON THIS PAGE: You will learn about how doctors describe ALL. This is called subtype and classification. Use the menu to see other pages. Doctors divide ALL into subtypes and classify the disease based on the type of lymphocytes that are affected. For example, flow cytometry (see Diagnosis) distinguishes between ALL involving T cells or B cells. Specific chromosomal or genetic changes in the cancer cells are used to help plan treatment and predict prognosis. Some patients have a type of leukemia called biphenotypic acute leukemia, also called mixed phenotype acute leukemia or ambiguous lineage acute leukemia. This means that the disease has characteristics of both ALL and/or acute myeloid leukemia (AML). Often, the same treatments used for ALL are also used for this type of leukemia. As described in Diagnosis, about 20% to 30% of adults with ALL have a genetic change or mutation called the Philadelphia chromosome (Ph). This causes 2 genes, BCR and ABL, to become 1 fusion gene called BCR-ABL. The Philadelphia chromosome is found only in the cancerous blood-forming cells, not in other organs of the body. It is not inherited. Therefore, there is no concern about an increased risk of ALL for other family members. The BCR-ABL gene causes specific types of white blood cells called B lymphoblasts to grow out of control. Knowing whether a person has the BCR-ABL gene helps the doctor predict a patient’s prognosis and recommend treatment. So, it is important to test for it. About 20% to 25% of patients with precursor B-cell ALL have a type of ALL called Ph-like ALL. The genetic changes found in the leukemia cells of Ph-like ALL act like those linked with the Philadelphia chromosome. But, there are no signs of the Philadelphia chromosome in the leukemia cells. Instead, the leukemia cells have other mutations that act similarly. This means that the same types of treatments used for leukemia with the Philadelphia chromosome may also work for Ph-like ALL. Newly diagnosed and untreated. The bone marrow contains abnormal lymphoblasts. The person may or may not have any symptoms. A patient often has decreased numbers of healthy white blood cells, red blood cells, and platelets. Some patients may have an overall increased number of white blood cells, but many of these may be abnormal lymphoblasts. In remission. A patient has received treatment for ALL. The bone marrow contains less than 5% blasts, and the patient has no symptoms. The numbers of healthy white blood cells, red blood cells, and platelets are normal. New monitoring methods, called minimal residual disease (MRD; cancer cells not destroyed by treatment) methods, are better able to find small numbers of remaining blasts. MRD methods are now being used more often to determine remission. Refractory. Refractory leukemia means that the disease has not responded to treatment. Recurrent or relapsed ALL. Recurrent leukemia has come back after being in remission. If the leukemia does return, there will be another round of tests to learn about the extent of the recurrence. These tests and scans are often similar to those done at the time of the original diagnosis. The subtype and classification of ALL will help the doctor recommend a specific treatment plan. The next section in this guide is Treatment Options. You may use the menu to choose a different section to read in this guide. Doctors and scientists are always looking for better ways to care for patients with ALL. To make scientific advances, doctors create research studies involving volunteers, called clinical trials. In fact, every drug that is now approved by the U.S. Food and Drug Administration (FDA) was tested in clinical trials. Patients decide to participate in clinical trials for many reasons. For some patients, a clinical trial is the best treatment option available. Because standard treatments are not perfect, patients are often willing to face the added uncertainty of a clinical trial in the hope of a better result. Other patients volunteer for clinical trials because they know that these studies are a way to contribute to the progress in treating ALL. Even if they do not benefit directly from the clinical trial, their participation may benefit future patients with ALL. Research through clinical trials is ongoing for all types of cancer. For specific topics being studied for ALL, learn more in the Latest Research section. Cancer.Net offers a lot of information about clinical trials in other areas of the website, including a complete section on clinical trials and places to search for clinical trials for a specific type of leukemia. In addition, this website offers free access to a video-based educational programabout clinical trials, located outside of this guide. The next section in this guide is Latest Research. It explains areas of scientific research currently going on for ALL. You may use the menu to choose a different section to read in this guide. ON THIS PAGE: You will read about your medical care after treatment for ALL is completed, and why this follow-up care is important. Use the menu to see other pages. Care for people diagnosed with ALL doesn’t end when active treatment has finished. Your health care team will continue to check to make sure the disease has not returned, manage any side effects, and monitor your overall health. This is called follow-up care. One goal of follow-up care is to check for a recurrence. ALL recurs because a few leukemia cells may remain undetected in the body. Over time, these cells may increase in number until they show up on test results or cause signs or symptoms. During follow-up care, a doctor familiar with your medical history can give you personalized information about your risk of recurrence. Your doctor will ask specific questions about your health. Some people may have blood tests or imaging tests done as part of regular follow-up care, but testing recommendations depend on several factors including the subtype of ALL originally diagnosed and the types of treatment given. This is also a good time to decide who will lead your follow-up care. Some survivors continue to see their oncologist, while others transition back to the care of their family doctor or another health care professional. This decision depends on several factors, including subtype and classification of ALL, side effects, health insurance rules, and your personal preferences. If a doctor who was not directly involved in your care for ALL will lead your follow-up care, be sure to share your treatment summary and survivorship care plan forms with him or her, and with all future health care providers. Details about your treatment are very valuable to the health care professionals who will care for you throughout your lifetime. The next section in this guide is Survivorship. It describes how to cope with challenges in everyday life after a diagnosis of ALL. You may use the menu to choose a different section to read in this guide. ON THIS PAGE: You will read about how to cope with challenges in everyday life after a diagnosis of ALL. Use the menu to see other pages. However, as treatment is completed, the caregiver's role often changes. Eventually, the need for caregiving related to the ALL diagnosis will become much less or come to an end. Caregivers can learn more about adjusting to life after caregiving in this article. People recovering from ALL are encouraged to follow established guidelines for good health, such as not smoking, limiting alcohol, eating well, and managing stress. Regular physical activity can help rebuild your strength and energy level. Your health care team can help you create an appropriate exercise plan based upon your needs, physical abilities, and fitness level. Learn more about making healthy lifestyle choices. ASCO Answers Cancer Survivorship Guide: Get this 44-page booklet that helps people transition into life after treatment. It includes blank treatment summary and survivorship care plan forms. The booklet is available as a PDF, so it is easy to print. What subtype of ALL do I have? How likely is it that my ALL will go into remission? Will I need to stay in the hospital at specific times during treatment? What is the chance that the ALL will come back? Should I watch for specific signs or symptoms?